The LOOK 795 Light RS stands out in any field. The LOOK 795 Light RS is part of the French bike maker’s iconic 795 lineup. This particular edition is billed as a more user-friendly version. Along with the LOOK 795 Light RS’s distinctively clean top tube/stem integration, the bike features a masterful blend of aerodynamics and weight savings. The LOOK 795 Light RS was spec’d with Shimano Dura Ace 9100 mechanical, the perfect complement to a top-level race bike. But while this bike ticks all the right boxes for aesthetic perfection, and its unique technological gains are hard to overlook, simply moving the brake calipers to a more accessible location on the frame or rearranging cable routing hardly offers the kind of user experience gains that a bike in this price range might be expected to afford. 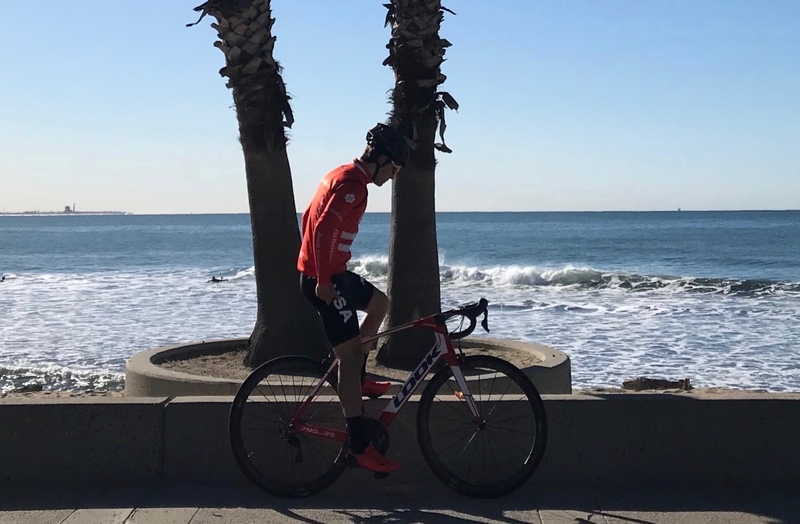 Indeed, during testing of the LOOK 795 Light RS we ran into a handful of practical constraints to this platform that are worth keeping in mind if you’re considering purchase. When first boarding the LOOK 795 Light RS, it’s hard to keep suppress the grin of a rider who knows they are on a LOOK. The name really is quite fitting. Other than a few practical limitations, which I elaborate on below, the LOOK 795 Light RS rides as well as you might expect from a bike in this high dollar category. And it is indeed light, with frame and fork on this size small coming in at just 2300 grams. That trademark top tube/stem integration lends this bike some of the cleanest lines out there. The front end is perfectly responsive at speed, inspiring confidence in its stability so as to make tight lines just as easy as a wide-open descent. The bike’s overall comfort is heads above aero bikes of the past, embracing the mating of speed with the practical need for comfort. Although many factors go into making a quality bike, LOOK understands that comfort must come first. Vibration damping, though not incredibly high (presumably due to the bike’s low relative weight), is more than enough to warrant wanting to spend hours at a time on the machine. Whether climbing or descending, this bike truly feels as though it has the best characteristics. 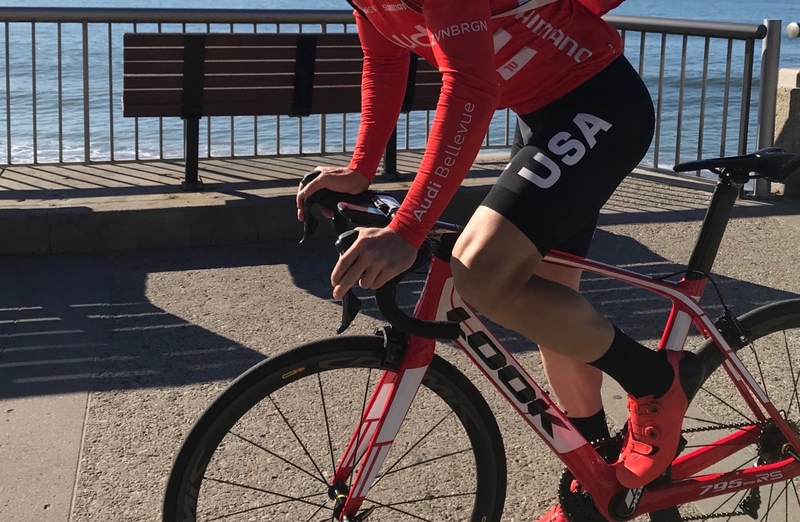 LOOK’s extensive aerodynamic testing in designing this bike is apparent at both high speed and at lower steady speed, when such a thing is harder to recognize but no less important. 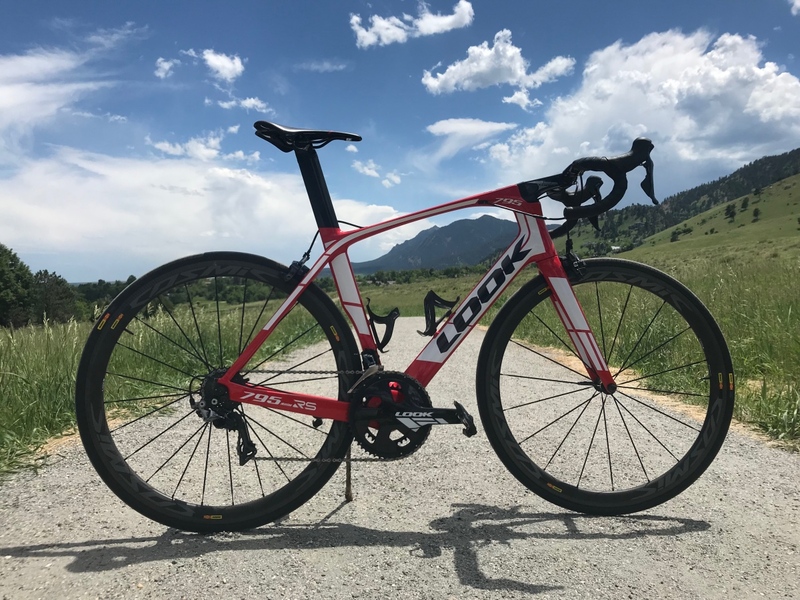 Equally impressive is the low relative weight of the LOOK 795 Light RS, a critical component in both overall efficiency when rolling the flats and climbing. Simply put, joining these two qualities is one of the most fundamental tasks at hand when developing a top-quality race bike and LOOK has done so with the flair you might expect from the storied French boutique brand. The integrated seat mast gave us some unforeseen difficulties in shipping, but the right box is out there if you know what you’re looking for. While a standout bike in both ride feel and in curb appeal, there are a couple of important factors to keep in mind when considering purchase of the LOOK 795 Light RS. The integrated seat mast on this bike is designed to increase stiffness and aerodynamics. Neither of these things are to be looked past in the production of an aero road bike. But LOOK’s answer to this system creates two issues, one inherent in such a system and one that is unique to their technology. First of all, an integrated seat mast is a tremendous pain when it comes to traveling. The height of the E-Post 2 EVO in the medium sized frame was too tall for a standard hardshell bike case to accommodate. A standard cardboard bike box was no match, either, so the bike sadly had to stay at home during the planned trip to Maui. This was a simple oversight, and many cases presumably would fit this frame, seatmast and all, but such a feature definitely requires a bit more planning than the standard bike packing routine. Even with the brake caliper wide open there was some rear brake rub. Secondly, bike fits change. Sometimes considerably, and even though LOOK does supply some shims to change the effective mast length, they’re not universally applicable and cutting could presumably be required. 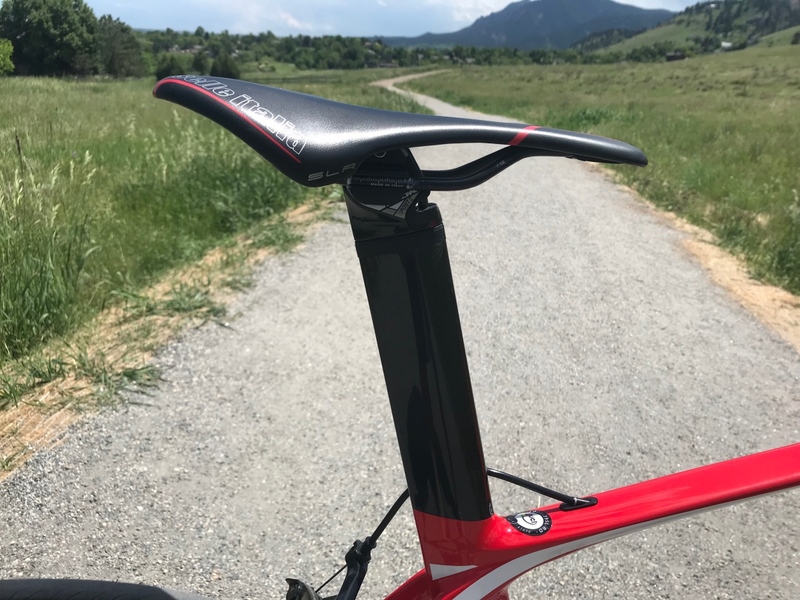 Such a task is not necessarily a problem, but once the seat mast gets cut to accommodate a rider’s changing fit requirements, the system can quickly become very hard to re-sell. 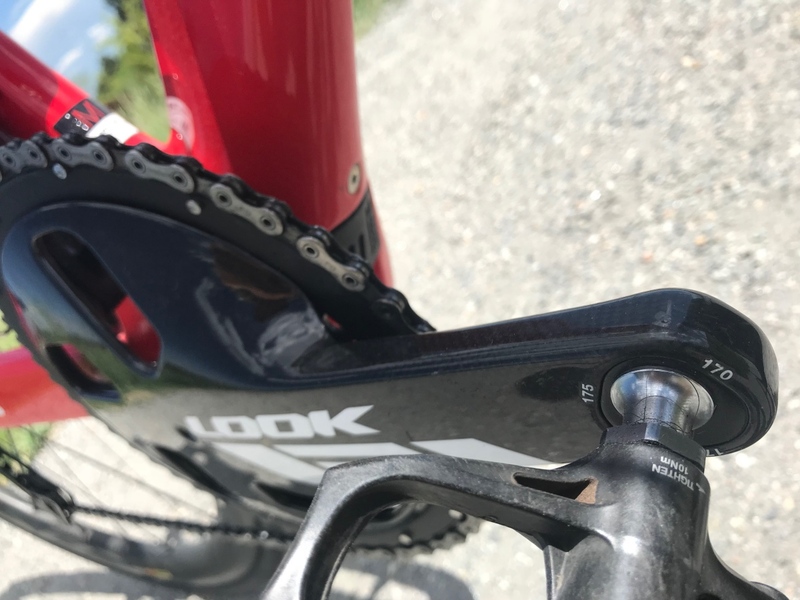 LOOK’s proprietary crank arm is a brilliant feature for simple interchangeability of this important piece of a bike’s fit. It’s a tremendous pain in the rear to have to swap out an entire crankset simply to shorten or lengthen a crank arm by a couple of millimeters. 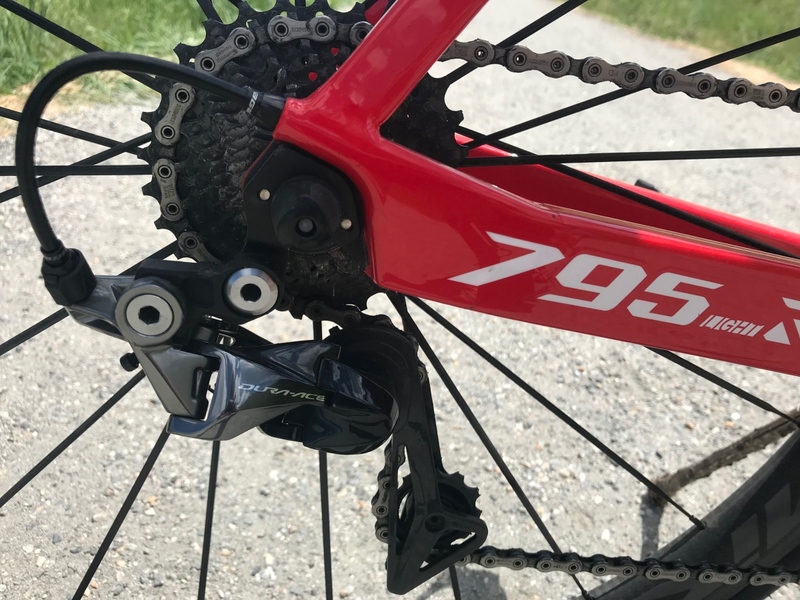 Allowing for simple interchangeability (between 170mm, 172.5mm, and 175mm) allows the rider, in turn, to ride LOOK’s own crankset, as long as they are within the low standard of deviation seen in crank arm purchases industry-wide. 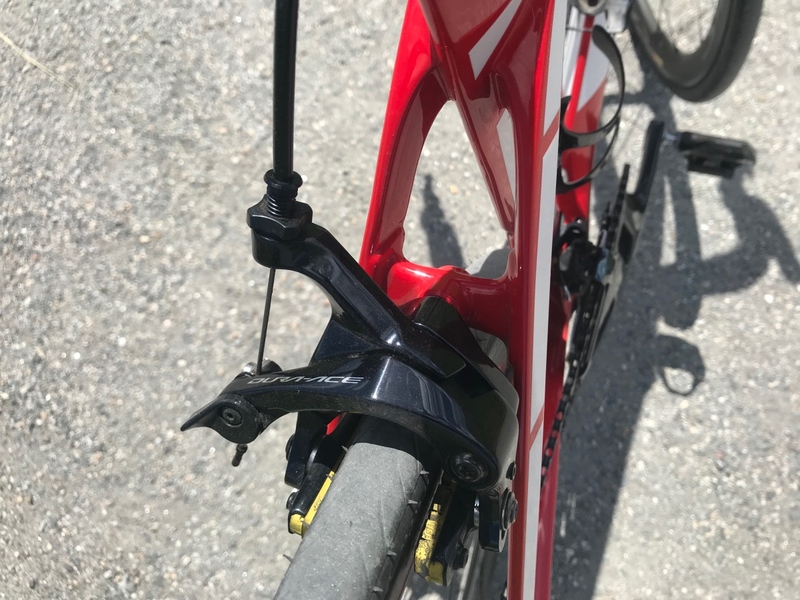 Importantly, this system hinges on two little nuts and bolts on either end of each crank arm that rotate to fit the desired effective crank arm length. This simple system has one minor drawback that created a mildly frustrating issue in testing. I lost one of the four little aluminum nuts, and the entire bike immediately went out of commission. Fortunately I had other options as I awaited a replacement part from LOOK, but I’d if this were your only bike, such a minor frustration might become a major frustration in a hurry. If you buy this bike, do not lose the little crank arm nuts. An aero bike is a fast bike, especially when the word “light” is its middle name. This leads me to determine that the rear end on the LOOK 795 Light RS is a bit soft for the stronger rider, at least in racing applications. The last thing a race bike should allow for is brake rub under acceleration. This defeats the purpose of racing. The Mavic Cosmic Pro Carbon wheels were fantastic. The braking surfaces were unparalleled, as far as a carbon rim brakes go. Despite not being able to bring the bike with me to Hawaii, I was able to pack the wheels and descending down some of the steepest back roads in Maui would have been scary on most carbon braking surfaces. But these wheels handled the job well. Our review bike came in red and white, but several other color schemes are available for those who prefer a more subtle paint job. The Mavic Yksion Pro tires that came paired with these wheels were also flawless under testing. They held air as well as anything I’ve ever tested, and they didn’t flat on me once in three months of testing. What’s more, they achieved incredible traction under varying conditions. This wheel/tire setup was perfect. It really left me free to focus on the bike. The Shimano Dura Ace 9100 Mechanical groupset this test bike featured is the ultimate race groupset. It’s lightweight, it’s perfectly functional, and it doesn’t decide to tune out before the ride is done. Not once did I have to divert my focus from this bike to its gearing due to mechanical imperfections. The test bike came equipped with LOOK Keo Blade pedals, as one might expect. Notably, it is difficult to find a LOOK bike dealer here in the states. But be warned, simply calling a shop doesn’t always help when attempting to locate a LOOK dealer, as most shops do deal LOOK pedals. They are incredibly popular in the U.S. And it’s no mystery as to why. The Keo Blades feature fantastic interface and a stable platform. Flawless durability under extensive testing (rain, dirt, and months of extreme load) didn’t faze these sleek little beauties. LOOK’s unique system for easy interchangeability of effective crank length can spare the new buyer a lot of heartache. Despite its impressive aerodynamic profile and lightweight platform, the LOOK 795 Light RS likely won’t be an amateur racer’s choice due to several inadequacies in overall user experience. 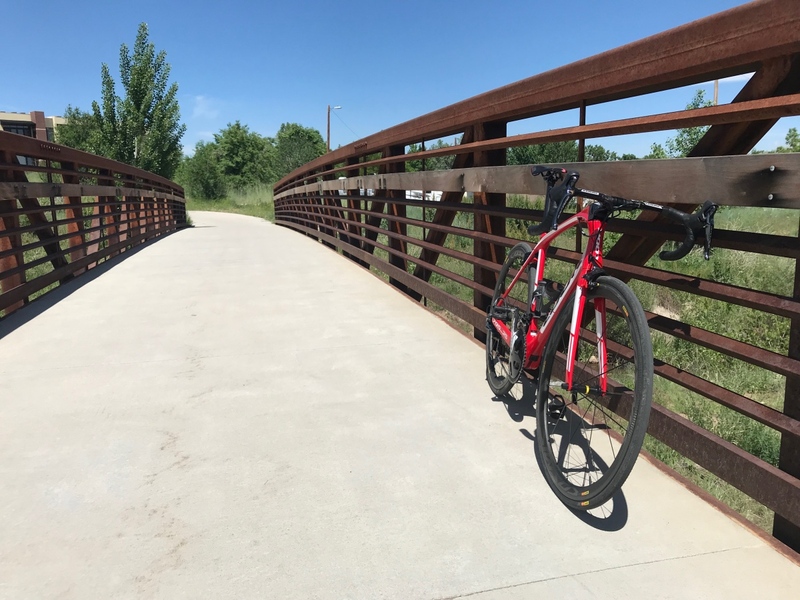 The difficulty of transportation, the overabundance of proprietary technology, and the lack of availability of unique parts highlight these realistic constraints to the bike’s utility as a daily driver. But let’s be honest, a LOOK really isn’t built for that purpose. For those who have the resources and patience to deal with the intricacies of an exotic breed, this machine is an impressively capable work of art. It will turn heads at every stop light, and for good reason.